The Medford Family Network is looking for in kind donations for raffle. Consider donating a small artwork or craft for this local organization. 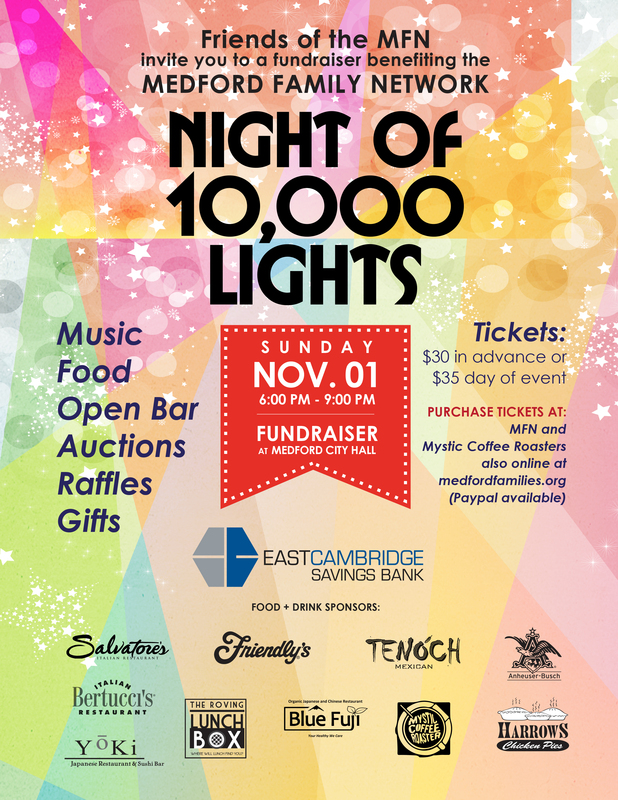 Laughter, delicious food, music, prizes, and most of all, community: these are just a few of the attractions at the Night of 10,000 Lights event held by the Friends of the Medford Family Network (FMFN). The fourth annual event will be held on Sunday, November 1, 2015 from 6:00 until 9:00 pm. Won’t you consider being a part of it? What is the Friends Medford Family Network (FMFN)? The Friends of the Medford Family Network’s mission is to raise and administer funds to support the programs of the Medford Family Network of the Medford Public Schools. From summer concerts in the park to parent workshops to playgroups in the park, the MFN offers no-cost programming which enriches the lives of Medford families. The FMFN depends on donations from local businesses and grants in order to offer these opportunities. What better way to gain visibility for your business, show your support for a loved community organization, and introduce an attendee to your product or service than to donate to the Night of 10,000 Lights? We are looking for in-kind donations of goods and services to raffle and auction during the Night of 10,000 Lights. All proceeds from the event go to support the programming of the Medford Family Network. The Night of 10,000 Lights promises to be an amazing celebration this year as always. Don’t miss your chance to be a part of it! The Friends of the Medford Family Network is a registered 501c3 non-profit organization.